The main difference between IDE and SATA is that the IDE provides a parallel connection to connect the storage device to the computer bus while SATA provides a serial connection to connect the storage derive to the computer bus. 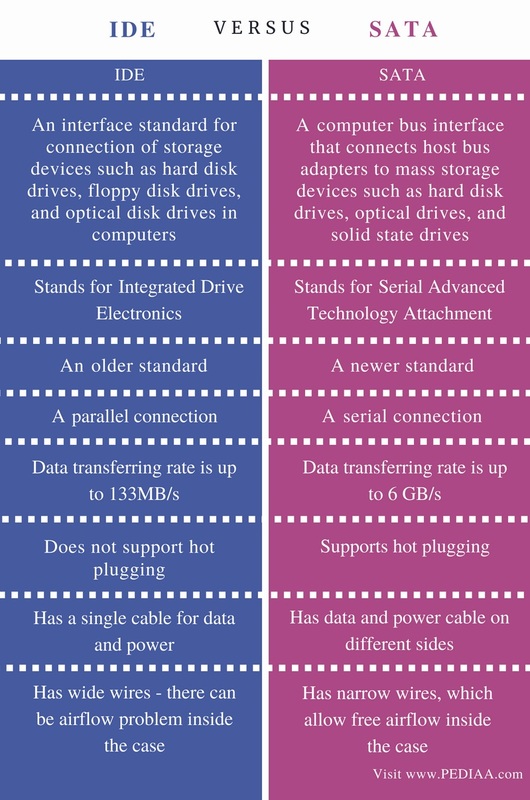 IDE and SATA are different types of interfaces to connect storage devices to a computer’s system bus. IDE is an older standard compared to SATA. IDE wires are bulkier and are more expensive. It has a maximum data transferring rate of 133MB/s. On the other hand, SATA wires are smaller, thinner and easier to manage. SATA has a maximum data transferring rate of 6GB/s. Modern hard drives and Solid State Drives use SATA. IDE stands for Integrated Drive Electronics. It is also known as Parallel ATA. It is an interface between a computer bus and disk storage drives. This interface is based on the IBM PC Industry Standard Architecture (ISA) 16-bit bus standard. It is used in computers with other bus standards as well. IDE is a parallel connector. Moreover, it requires all the parallel signals to arrive at once. Therefore, IDE does not provide a high speed of data transferring. SATA stands for Serial Advanced Technology Attachment. It is also referred to as Serial ATA. It is an interface that helps to transfer data between the computer’s bus and storage devices. It was designed to overcome the limitations of IDE. SATA is a serial connector. It provides faster data transferring through higher signaling rates. It also reduces cable size and cost. Most IDEs are now replaced by SATA in desktops and laptops. There are two variations of SATA as eSATA and eSATAp. eSATA is for external connectivity. It cannot be used to supply power from the motherboard to the hard drive. eSATAp combines both eSATA (high speed) and USB (compatibility) into a single port. IDE is an interface standard for connection of storage devices such as hard disk drives, floppy disk drives, and optical disk drives in computers. SATA is a computer bus interface that connects host bus adapters to mass storage devices such as hard disk drives, optical drives, and solid state drives. Integrated Drive Electronics is the long form of IDE while Serial Advanced Technology Attachment is the long form of SATA. IDE is an older standard while SATA is a newer standard. Parallel ATA is another name for IDE while serial ATA is another name for SATA. While IDE is a parallel connection, SATA is a serial connection. Data transferring rate is up to 133MB/s in IDE interface while SATA interface provides a data transferring rate up to 6 GB/s. IDE interface does not support hot plugging, but SATA interface supports hot plugging. 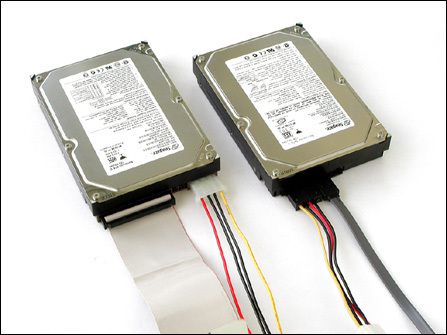 Therefore, it is possible to add or remove drives to SATA when the computer is running. Whereas IDE has a single cable for data and power, SATA cable has data and power cable on different sides. Since IDE has wide wires, there can be airflow problem inside the case. However, SATA has narrow wires, which allow free airflow inside the case. The difference between IDE and SATA is that the IDE provides a parallel connection to connect the storage device to the computer bus while the SATA provides a serial connection to connect the storage derive to the computer bus. 1. “What Is IDE (Integrated Drive Electronics)? – Definition from WhatIs.com.” SearchStorage, TechTarget, Available here. 2. “Serial ATA.” Wikipedia, Wikimedia Foundation, 26 Aug. 2018, Available here.